Your Fast Flexible Factory Starts Here. Decisyon Digital Factory goes to work immediately. It can be applied to a factory’s current workflow, or be easily adapted to a company’s specific production needs. Customize it and deploy it everywhere in less than 6 weeks. We’ve put it all together, so you don’t have to. Decisyon Digital Factory brings together all of the data, KPIs, visualization and analytical functionality you need to get and keep that edge. 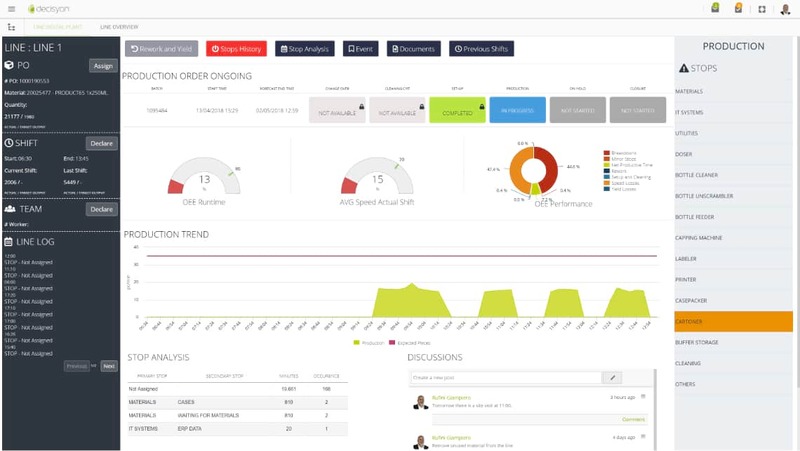 You’ll experience a flexible, visual, intuitive product that can be used “out of the box” or easily customized to your KPIs, workflow, or specific production requirements. You can do all of this without custom coding and endless development cycles. Provide production with a single point of access to all relevant data -- production data, line status, production orders phases, quantity produced, ongoing information, OEE, etc. The company required a digitized environment for collaboration, information sharing, and decision making across plant operations, and manufacturing sites worldwide. Decisyon Digital Factory provided a Visual MES solution that spanned multiple facilities, and integrated plant operations across disparate systems and processes. The Visual MES solution improved operational communications, provided a 360-degree view of the entire operation (better decisions, improved processes, risk mitigation), and helped reduce costs through automated data collection and proactive intervention when issues would arise. A global manufacturing company was plagued by inefficiencies with its manual, paper-based production operations. By implementing the Digital Factory Solution, the multinational firm was able to provide a 360-degree view of its shop floor to its staff — from production line coordinators to plant directors. The Digital Cockpit solution helped transform the firm’s manufacturing operations, enhancing shop floor efficiencies with its staff across plants and geographies, and boosted its ability to define and implement targeted actions.